Oxford has seven major Museums and Collections, including of course the Ashmolean Museum and the Bodleian Library. One of our much-loved museums is the Pitt Rivers Museum which houses over 500,000 objects from almost every country in the world and from all period of human existence. The museum has a very characteristic layout, with objects being arranged by ‘type’ rather than by time or region. This reveals fascinating distinctions and parallels across cultures, and says much about humankind throughout the ages. 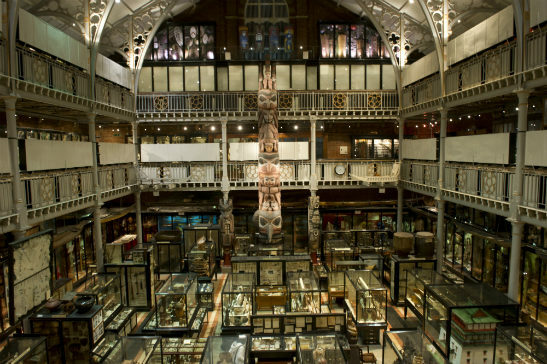 The Pitt Rivers Museum has an important Japanese Collection that dates right back to the beginning of the museum when Pitt Rivers gave his collection of archaeological and ethnographic objects to the University. Among these objects were 300 from Japan. These were added to over the years and now the collection comprises over 20,000 objects from Japan including a large and important collection of netsuke, rare photographs of the Meiji era, Noh masks, arms and armour and an exceptional collection of paper amulets. The Pitt Rivers Museum has many loyal and enthusiastic fans, including many repeater visitors, and the museum is sometimes described as “quirky” or “eccentric.” Please look at the Pitt Rivers Museum website which includes an informative introductory video to find out more and to plan your next visit.